This is something I believe in so much that I took classes and worked with experts internationally to lead my own workshops – which I called CREATE YOUR LIFE WORKSHOPS. It is a way to manifest your dream life. When you make a Vision Board, you get clear on what you want to create in your life. Many of us have fleeting ideas of what we want to be, do, or have in our lives. But they remain just that: fleeting. After all, who has the time to intentionally get clear about what we want to create? Everyone, from Katy Perry (who did a Vision Board in the 7th grade showing her winning a Grammy) to Ellen DeGeneres to Oprah Winfrey swear they intentionally created outcomes by using a simple tool: VISION BOARDS! Michelle Obama did one in 2008 showing Barrack Obama being sworn in as President! As someone who has made my own Vision Boards (and manifested some amazing results! ), I’ve learned it is more than just slapping a piciture onto a poster board. It is about getting clear on your authentic life by letting go of what’s in the way – and then clearly connecting with your dreams while designing a vision that calls to you. 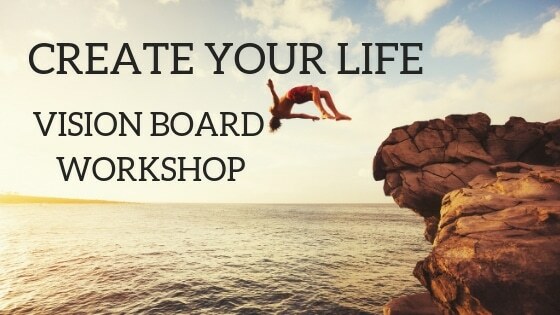 That’s why I put this workshop together – to give you the space you need to intentionally define your dreams and created a VISION BOARD that will effortless attract your ideal outcomes to you! Your very own Vision Board to take home and attract positive outcomes for the months a head. A hand out about how to follow up with your Vision Board and also one about the importance of having a Word of the Year. I offer these to groups, either professional our groups of friends, in a place of their own. I also offer them four times a year in my own studio. This entry was posted in VICKIE MARTIN ART on September 25, 2018 by vickiemartin.